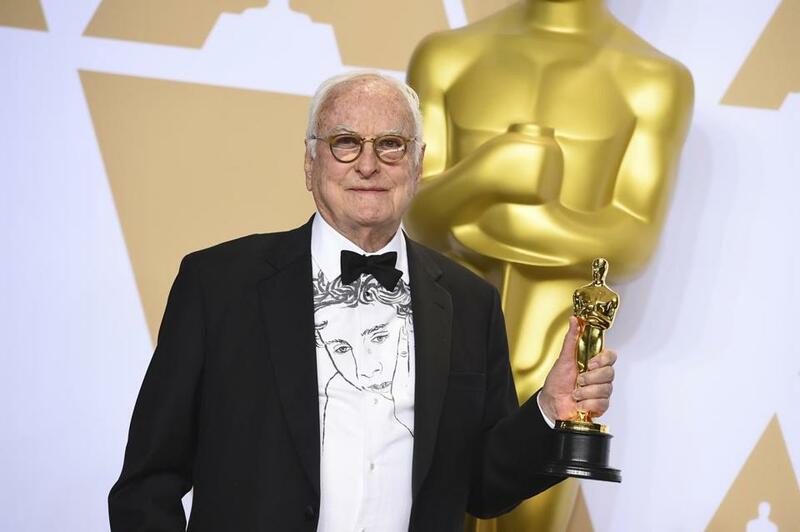 James Ivory holds his Oscar for best adapted screenplay earlier this month at the Academy Awards in Los Angeles. Fresh off his Academy Award for best adapted screenplay for “Call Me by Your Name,” renowned director James Ivory visited Newport’s Jane Pickens Theater on Sunday for a screening of one of his best-known films, “The Remains of the Day” (1993). After the screening, Ivory engaged in an onstage talk with Chuck Hinman of Rhode Island National Public Radio. He said the biggest surprise he’s experienced over the past year is “the extraordinary passion” that teenage girls have shown for “Call Me by Your Name,” an Italy-set romance between 17-year-old Elio (Timothée Chalamet) and older Oliver (Armie Hammer). “It’s not simply Timothée Chalamet, although that has a lot to do with it. I’ve been to screenings with lots of young girls there and they are crying and crying. I didn’t think the film had that kind of relevance, but it does,” said Ivory, who revealed that his next project will be with director Alexander Payne but he didn’t want to elaborate.